Anti-fatigue mats are an important addition to the kitchen floor. In order to keep customers coming back, restaurants have to continually reinvent themselves and provide quality food and offers exceptional service. However, tastes change over time, and it’s important to adapt to shifting trends. Chefs standing on the anti-fatigue mats of the kitchen are keeping on their toes in order to entice potential customers with new culinary offerings. According to the National Restaurant Association, rising chefs are trying to be more innovative while still being efficient in the kitchen. Thanks to technology and new concept restaurants, people training to work in the field are finding themselves learning a new skillset to stay innovative. Among some of the changes in the industry, the move toward an open kitchen concept that helps keep the workflow productive, and consumers stressing the importance of using sustainable and local ingredients. However, in order to keep operations running smoothly and sourcing food locally, cost strategy plays a key role. One way restaurants are staying innovative is utilizing technology in the kitchen. According to Fast Casual, some restaurants are using robots as a way to assist chefs. Repetitive tasks such as chopping vegetables can be done through robotics, leaving the chefs able to focus on creative innovative cuisine. 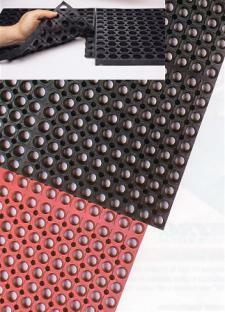 Anti-fatigue mats can help reduce the pain of standing. Working in a restaurant can mean spending long hours standing, ultimately having an effect on your feet and joints. While anti-fatigue mats can rubber-soled shoes can help, because they both reduce the strain placed on joints while standing on hard tiles, it’s critical to look for other opportunities that help reduce the amount of time spent standing. Being more efficient in the kitchen can mean not only are you more prepared for a rush of crowds, but you’re spending less time being stationery and working on a specific task at hand. Food Newsfeed reports it’s important for restaurant managers to take a step back and look at all of their processes and procedures to see what is working and what’s not. The news provider suggests mapping out every single process to see where the biggest time burdens are. QSR Magazine reports there are plenty of opportunities to help cut down on time prepping and instead focus on other tasks to make your shift a success. Prepping the ingredients is a major aspect, as the news provider reports that using a blender to finely chop ingredients not only reduces the amount of time standing in one place over a cutting board, but it helps the ingredient be ready in seconds flat. Anti-fatigue mats typically line the kitchens to keep workers safe from falls. Restaurant managers need to always be on the lookout for proficient workers to add to their roster. The food sector is always steady, and there need to be employees to line the anti-fatigue mats of the kitchen to accommodate all guests and deliver great food. However, as the job market picks up it’s becoming more difficult to source these kinds of employees, as jobseekers have their pick of employment. Bloomberg reports that while previous years have shown that the New Year is usually a burgeoning time for temporary workers to turn to the restaurant industry to look for placements after the rush of retail, there may not be as big of a surge this year. Because there are less people looking for work, restaurant managers are having a difficult time making sure they are fully stocked and ready to serve customers. Managers are trying to think of creative ways to draw in top talent. According to Restaurant Dive, more restaurants are offering mentorship programs to show how lower ranking workers can ultimately climb the chain throughout their career. They’re also offering benefits such as parental leave for employees or higher wages in order to entice more skilled workers. Add anti-fatigue mats to keep fall prevention at the forefront. Are you up to date with your worker safety training program? It’s critical to make sure you have a healthy and safe working environment, but unfortunately a lot of organizations can fall behind. Safety and Health Magazine reports that the most common violations for safety is the general requirements for fall protection at number one, and the training requirements for fall protection at number eight. To avoid being penalized for violations, and to avoid paying for an injured employee, it’s critical that you make fall prevention a priority. In addition to having a training program, you may want to consider having anti-fatigue mats on-site, which can add some traction and help people keep their balance, preventing potential falls. The Mayo Clinic suggests there are other ways you can reduce the chances of an employee falling while on the job, like making a clear pathway and keeping the workplace clear at all times. Remove boxes, plugs and other raised items that could unintentionally trip someone who isn’t looking where they are going. Additionally, making sure the workplace is well-lit, so employees can see the path in front of them, can help identify any potential tripping hazards that could lead to a fall.